This is a completely herbal supplement that helps eliminate the symptoms of menopause in peri-menopausal or menopausal women. It is used as a remedy for hot flashes, mood swings, night sweats, anxiety, and other signs of ageing in menopausal women. It also helps improve mood and memory. Rehmannia (processed): Nourished the kidneys and liver and improves adrenal function. It reinstates the hormonal balance. It also lowers blood pressure and has other anti-ageing benefits. Fructus cornus: Eases hot flashes, stops excess sweating, keeps kidneys and liver healthy. Cortex Moutan: This is the bark of the root Paeonia suffruticosa. Nourishes and cools blood. Discoreae root: Has neutral energy that balances yin and yang. It also replenishes body fluids and trace minerals like copper, calcium, potassium, iron, manganese and phosphorus. Poria: Keeps the spleen and mind calm. Alisma: Prevents water retention and urinary problems. It also lowers blood pressure, blood cholesterol, blood sugar and also has anti-bacterial properties. Anemarrhena: Clears excess ‘fire’ and nourishes yin energy. Rich in flavonoids and has antioxidant properties. Eclipa: A cooling and restoring herb. Keeps hair and liver healthy. Also acts as an antioxidant. Ligusticum: Nourishes kidney and liver. Reduces heat and therefore, the occurrence of hot flashes and night sweats. Improves the vision as well. Epimedium: Nourishes both yin and yang energy. Maintains healthy bone density by providing required minerals and bone growth factors. It keeps multiple menopause symptoms like hot flashes, night sweats, mental disturbances, irritability, insomnia and palpitations in check. It slows ageing and promotes longevity. It is also a common ingredient in fertility supplements. Lycium – Goji berries: Enhances the immune system, sexual functions and fertility. It is also rich in beta-carotene and vitamin B1, B2 and C.
Licorice root: Tonic for the pancreas. Also contains flavonoids, which are strong antioxidants, which prevent tissue damage by free radicals, reduce inflammation, and have an anti-ageing effect on the body. 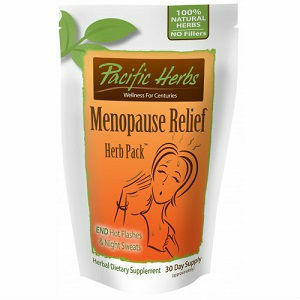 Menopause Relief Herb Pack is in the form of herbal granules that can be mixed with water as a tea or can be kept on the tongue and swallowed directly with water or juice. Recommended dosage is 1/2 tsp twice a day, once in the morning and once at night. For women with extreme symptoms, the dose can be increased to three times a day. Once the symptoms recede, a smaller maintenance dose of half tsp per day can be taken. The supplement should be used for at least 3-6 months to bring complete relief from symptoms. This product does not have any side effects and is completely safe for use. The price for this product is $49.95 per month’s supply. There is no guarantee or money back policy of this product. However, in case there is something major wrong with the product, they accept returns if convinced with the reason. They do not guarantee the effectiveness of the product. This is an herbal product with no side effects. It is a good product that helps curb the symptoms of menopause. Jackie Horowitz	reviewed Pacific Herbs	on December 19th	 and gave it a rating of 3.